An easy-to-use mix that can be used as a base to create your signature desserts. Sugar, Carrageenan, Fumaric Acid, Potassium Citrate, Flavouring, Colourings (including E102). All Food Additives Are of Plant Origin and Synthetic Origin. May contain traces of cereal containing gluten, egg, soy and milk. 1. Pour in 2 litres of boiling water into a bowl. 2. 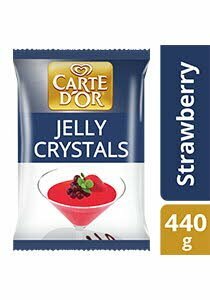 Stir in 1 pouch (440g) of Carte d'Or Jelly Crystals slowly until dissolved. 3. Pour into moulds / cup, sets without refrigeration in 30 minutes.